If you don’t know much about Dallas, one thing you can take away from today’s post is that the weather here is incredibly volatile. Over the last couple of weeks, we’ve had 20 degree temps and snow flurries, 85 degree heat and sunny skies, crazy thunderstorms and wind, you get the drill. In fact, on one day we experienced a 50 degree drop in the temperature in a matter of hours. It was insane! With that said, Dallasites sort of have to be ready for anything. These crazy weather changes have done a number on my health (currently suffering through allergies and a relentless cough – tiny violins, I know), and my hair. I’ve been throwing my hair in a ponytail a bunch lately, which is something I normally never do. I almost always wear my hair down! It’s just not worth wasting my time curling or blowing it out perfectly to be messed up by rain, wind, and the like. For a sweater you can transition to spring, try this soft wisteria-hued sweater from Rebecca Taylor. So feminine and romantic! This chunky cardigan would be an ideal traveling companion – the shorter sleeves make it another piece you could wear longer. If you’ve been loving the brights on THE SHOP, you’ll fall head over heels for this turquoise knit! I would definitely enjoy this fuzzy, chunky scarf on the colder days here in Dallas. Looks so cozy! For the navy or nautical-obsessed, try this FRAME sweater. This chunky winter white cable knit sweater is a staple your closet desperately needs. LOVE that sweater on you, Merritt! Have a wonderful day ahead! 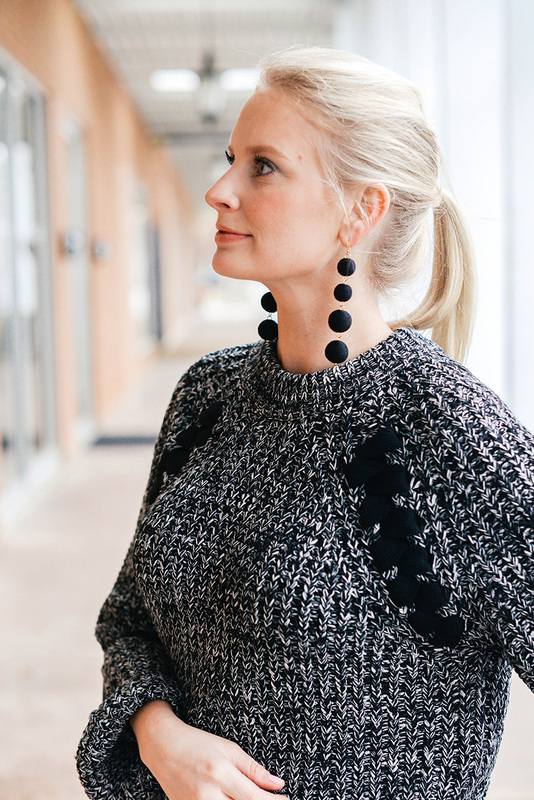 Such a great sweater and too cute with those earrings! 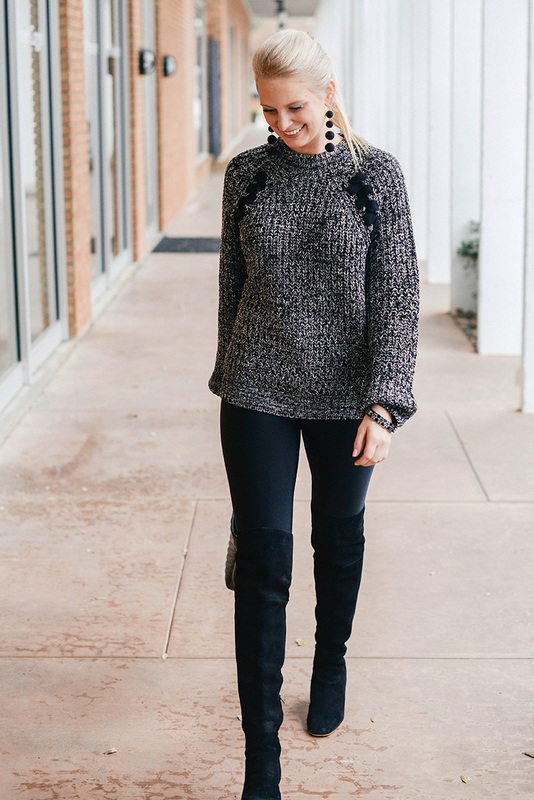 Cute details in the sweater! this look is soooo cute!! You would never know that the weather was doing a number on your hair, because you look super fab!